External Wall Insulation from Alpha Building and Heating Ltd.
Professional external wall insulation services across Birmingham, Stourbridge, Bridgnorth, Worcester, Dudley, Bromsgrove, West Midlands, Worcestershire, and surrounding areas. External wall insulation is the ideal way for you to enjoy a warmer home without compromising the outside aesthetic of your home. Why Choose External Wall Insulation? Around 45% of energy can be lost through uninsulated exterior walls. 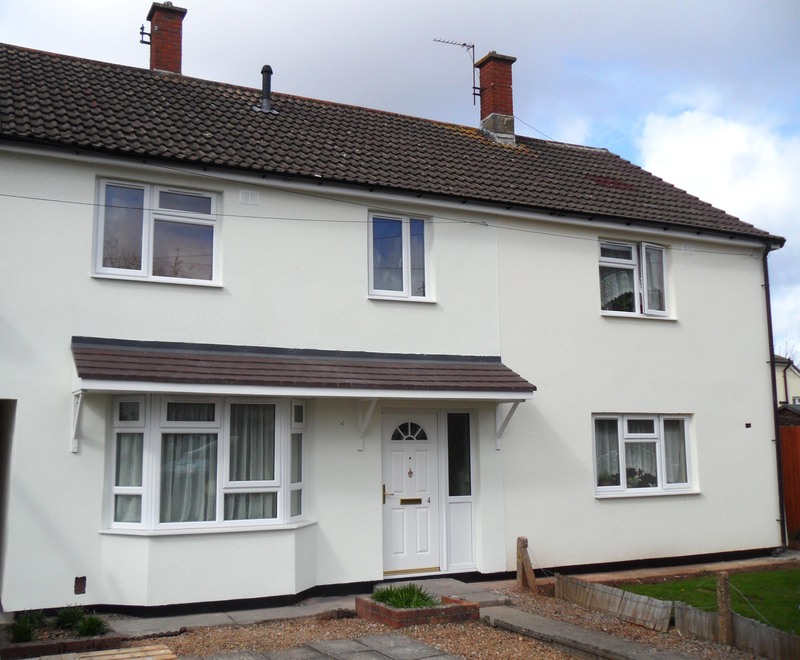 Investing in external wall insulation (EWI), also known as solid wall insulation, is one of the most effective ways to improve energy efficiency and can significantly help reduce energy loss and so lower your fuel bills. This is done by wrapping the building in a thermally resistant envelope, which in turn helps maximise internal space and helps maintain internal temperatures all year round. There are so many reasons why insulating your external solid walls is a great energy-saving measure. Our professional team will be able to ensure your external wall insulation is installed to the highest standard. This means that you won’t have to worry about any unsightly new additions to your home, and you can rest assured that you’ll be bringing a worthwhile investment to your home. More than 400,000 properties in England and Wales could be taken off the lettings market because they fail to meet energy performance standards. From 1 April 2018, privately rented properties must meet new energy efficiency standards or landlords won’t be allowed to rent them out to new tenants or relet to existing ones. We carry out energy efficient installations to improve the energy efficiency of homes. Further to this, external wall insulation has been used across Europe since the 1950s! It stands as a tried and tested insulation technique that will give you the assurance that comes with knowing you’re bringing something worthwhile to your property. For your peace of mind, we also integrate a fire break feature into the wall insulation systems that we install onto a building that contains more than one flat or apartment. In the unfortunate case of an internal fire, this break will work to contain the flames. Our external wall insulation offers more than just comfort for your home, it also allows you to bring a personal touch to your property. This includes the option of a silicone textured finish that is available in a range of colours. Whether your home is modern, traditional, period or heritage, we’ll have something to suit perfectly. As a guide price, investing in external wall insulation for a typical three bedroom semi-detached house could cost you around the £8,000 mark. The final price will be determined by a number of factors, so the best thing to do is to get in touch with a member of our team to discuss which option is best for your home. We are able to accommodate a wide range of properties across a range of sectors, including houses, flats, maisonettes, bungalows, blocks of apartments/flats, owner-occupied buildings, privately rented buildings, social housing, and more. Our team will fix the insulating panel to the wall using adhesive mortar. This will work to ensure the structural integrity of the insulation, and in turn, its durability. We then drive plastic capped fixings into the insulating panels and around their perimeter into the wall. This works to tie the panels securely to the wall. Once the panels are secure, we’ll then apply mortar over the insulating panels and fixings. This will serve as the solid foundation for the next phase. To help hold the panels in place, we integrate insulating mesh into the mortar. This means that you won’t have to worry about any shifting over time. With the insulating mesh in place, our team will then sand the mortar to apply the primer. This allows the rendering stage to be as effective as possible. To bring a beautiful finish, we then silicon texture your external wall insulation. This is available in a wide range of colours to ensure you can bring a personal touch. When it comes to planning permission, we advise you to contact your local authority for clarification on what will be required. Further to this, planning permission may be required for works to a listed building or for a building in a conservation area. How Thick Will My External Wall Insulation Be? 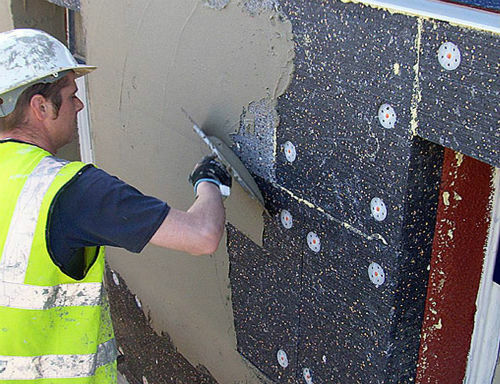 Our insulation boards vary from 20mm to over 150mm, with the most popular option being 100mm. It is important to note that factors such as space confinements, u-value, and building regulation requirements are all taken into account. Ultimately, a 100mm thick finish will usually achieve the best results. How Long Will the External Wall Insulation Take to Install? For a semi-detached property, our external wall insulation service will usually be completed, from start to finish, in two weeks. Will My Sky TV Reception Be Affected During the Installation? Any dishes will be attached to the outside of the scaffolding where possible. Will Weather Delay the External Wall Insulation? It is important to note that certain weather conditions can delay the installation of external wall insulation: including if the weather is too hot, too cold, or if it’s raining or snowing. Get in touch with us via our online contact form to speak to a member of our friendly team, who will be more than happy to offer you a bespoke external wall insulation quote. Alternatively, you can get in touch with us via this method should you have any questions. Professional installers of boiler replacements, external wall insulation, domestic scaffolding, commercial scaffolding, and central heating services across Birmingham, Bridgnorth, Bromsgrove, Dudley, Stourbridge, West Midlands, Worcester, Worcestershire, and surrounding areas.